The Chest of Drawers is handcrafted in traditional Shaker styling and construction. 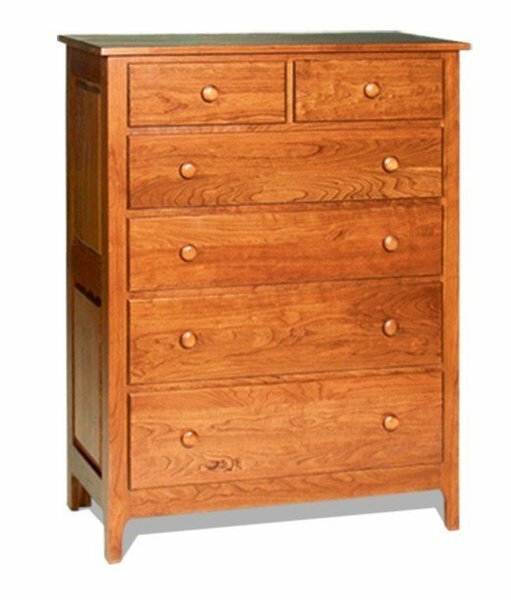 This Shaker chest of drawers offers plenty of deep drawers for storing clothes or linens. Raised panel sides, wooden Shaker hardware and drawers that show off the solid wood grain are some of the standard features for this item. A chest of drawers is a must have for the bedroom. So if you are going to spend the money on it then you might as well purchase a quality one solid wood one! Our Shaker style chest of drawers has solid hardwood construction, dovetail drawers, solid wood drawer slides and even dust covers between drawers. You can upgrade to full extension drawer slides or even one with the soft closing option as well. Choose to have the Amish bedroom furniture handcrafted for you in oak wood or cherry wood. We offer a wide variety of finish options from unfinished to a distressed painted finish. If you are looking to have this item matched to your exisiting furniture we can do a custom stain match. Please call one of our Amish furniture specialists with questions or ordering assistance. This item can be customized. Please allow for 6 to 12 weeks for this piece to be made. The dresser that I received is beautiful, and very well made.